What Do the Sword Cards Mean? The Tarot suit of Swords is typically associated with the element of air, and is a suit that often indicates power, change, and conflict. 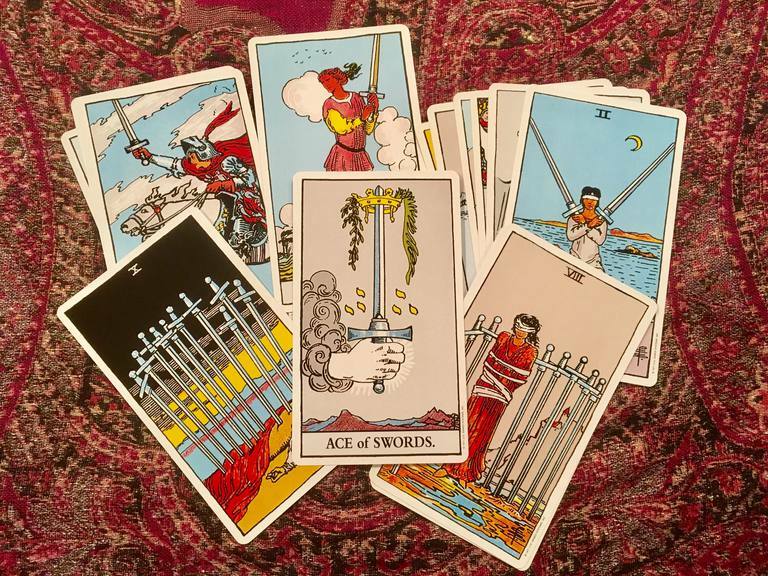 If you see a lot of Swords in a reading, it can mean that the querent is seeking solutions to problems related to internal or external struggles, as well as the need for solid and firm decision-making. Let's take a look at what the individual Sword cards mean when they appear right side up or in reverse. The Ace, or One of Swords is–like all Aces and Ones–a sign of new beginnings. Because Swords are typically associated with conflict and discord, when the Ace shows up, it's usually a sign of victory. If you've achieved some degree of success, it's because you've earned it through your hard work and efforts. Now all the struggle has paid off. "The Ace of Swords represents a period of great insight and mental clarity. It signifies a ‘break-through’ or an ‘aha’ moment where suddenly conscious understanding and mental reasoning reach their peak, and achievement of goals suddenly becomes a lot easier. You have a new understanding of some issue that has been of concern, or, in a broader sense, a new world view. This is a perfect time to clear away the fog that has kept you from seeing the inner truth, so that you can now cut to the heart of the matter." When the Ace of Swords is reversed, you may be feeling successful but you're pushing too hard. It's time to sit back and calm down, let things chill for a bit. Otherwise, if you keep driving your point home, someone is going to get hurt. This card in reverse can also indicate a sense that other people may be holding you back from your goals - sit down and re-evaluate and figure out if the problem is really with other people, or simply with your perception. When the Two of Swords appears, it often indicates someone who has put up an emotional wall as a defense mechanism. After all, if you build a wall, it can keep you from getting hurt again. However, it also prevents you from enjoying all the good things that might be coming your way. Think about whether your own defenses are preventing you from moving on. Is there someone you need to open up the doors for so you can let them into your life and your heart? Again, the Swords suit focuses on conflict, only this time the Two of Swords is reversed, which shows that your over-protectiveness–either of yourself or others–has caused a rift. Teach yourself to be more open-minded, and give people the benefit of the doubt occasionally. Understand that there is a difference between protecting those you love and stifling them. This is a card of discontent. It typically represents heartache and pain, often to do with failing or struggling relationships. Is there a love triangle going on? Are you–or your lover–feeling conflicted about whether or not there should be someone else in the picture? Evaluate romantic relationships and make decisions to improve them when you see this card. When your Three of Swords shows up reversed, it means there's hope for salvaging what's broken. Open up the lines of communication, try to listen more than you speak, use your words wisely and it's entirely possible that jealousies and petty squabbles can be resolved for the good. Feeling worn out, burned out, and just plain beat? Think maybe you're burning the candle at both ends? That's the Four of Swords talking to you! Emotional and physical exhaustion can really take their toll on people–you need to give yourself a break and find a way to rejuvenate. Maybe you can't take a week-long vacation from work, but perhaps you can take an afternoon to go walk from the woods. It's not practical to leave your kids alone all day, but maybe you can drop them off for a play date with friends, and then treat yourself to a coffee with friends of your own. Figure out what's stressing you out, and then come up with a plan to get some relief. This card often indicates someone who has been plagued by fatigue or illness but is now on the road to recovery. However, even as our bodies rejuvenate physically, it's often hard to get our brains moving forward. The reversed Four of Swords is telling you it's time to get up and get moving. Move on from whatever ailment was dragging you down–it's over and done with, and you need to look at the future instead of dwelling on the past. When the Five of Swords appears, this is typically indicative of hurt feelings. It's time to mend fences and admit when you've wronged someone. Sometimes, this card can indicate a betrayal as well–do you trust everyone who's around you? Should you? Ask questions to figure out what's going on, but remember that doing so discreetly and with caution will get you farther than running in with guns blazing. When the Five of Swords appears in reverse, it can indicate someone who won't let go of an argument, even when they've won! The fight is over, you've made your point, and everyone knows your opinion. Now you need to move on, and stop beating a dead horse... and don't gloat over a victory. "There may also be some residual resentment following a recent or past argument with someone close to you. You have had some very challenging and heated conversations together and you still harbour some negative emotion from these discussions. This may still be unresolved and unaddressed and this in itself is impacting your ability to create a harmonious relationship." Although Swords are typically symbolic of conflict and turmoil, they can be positive too. The Six of Swords is one of those positive cards–it's an indicator that life is on the upswing, you've survived the battle, and things are improving. Not only are your circumstances getting better, you're developing as a person and learning how to better deal with the problems you may face in your life. When the Six appears in reverse, things are still improving, but probably not as fast as you'd like. This is a good opportunity to evaluate how you can make changes to speed things along. Is there someone you need to speak to? An action that must take place before things are back to normal? Get on it, and get it done. The Seven of Swords typically indicates deception. Someone is not being entirely truthful with you about something of importance. Do you trust everyone you love? Is it possible that one of them is keeping secrets from you? Sometimes this deception is not in your personal life but your professional one. How do you get along with co-workers? Is someone whispering behind your back, trying to undermine your role? Sometimes when people don't tell us things, we feel out of the loop, frustrated and a little bit betrayed. But often, that omission is simply an oversight rather than deliberate maliciousness. That's where the Seven of Swords, reversed, comes in. Understand that if you got let out it's not because anyone was trying to be sneaky–it's because they simply didn't think. There's no ill intent going on here. Having trouble accomplishing your goals? The Eight of Swords indicates that it's your own fear of failure holding you back. If you're scared to try new things because they might not work out, you're never going to get anywhere. Accept the risk, take a leap and jump right in to make things happen for yourself. A reversed Eight of Swords indicates that you're moving forward. You've learned to deal with your own fears and insecurities, and they're no longer holding you back. In addition, you're learning to be less frustrated with the shortcomings of other people–if you're in a leadership position, this can be a valuable career benefit. In many divinatory traditions, the Nine of Swords is associated with mental illness, debilitating depression, and overwhelming misery and sadness. If you don't have someone to talk to about what's causing that inner pain, you need to find someone right now. Talk to a friend or family member, but don't wait any longer. The misery will only multiply if you keep it bottled up. Also, remember that burdens are easier to carry when they're shared. A reversed Nine of Swords is very similar to the upright Nine of Swords, in that it indicates a need to communicate when you're feeling down. However, this card in reverse is stronger, and it means you may need a professional level of intervention. Do you have a therapist you can talk to? Now is the time to find one. Are you thinking about hurting yourself? Get help immediately. This card is a message not to delay any longer–time is of the essence! In many traditions, the Ten of Swords is a portent of grief. Death of a loved one, end of a relationship, or the finality of something else that is important to you are all indicated by the Ten of Swords. Often, it is seen as a card of heartache and sadness. Feeling miserable? It's entirely possible that someone is deliberately trying to cause you pain or harm, when the Ten of Swords appears in reverse. Look around you and figure out who has the most to gain by making you suffer. Like all Pages, the Page of Swords is a messenger card. It means it's time to take a look around you to figure out what matters most in your life. Also, your enthusiasm and excitement can indicate that this is a time of new beginnings. Thinking about starting a brand new venture or relationship? The Page tells you this may be a good time for that! The reversed Page of Swords is a messenger card too, but this time he brings somewhat less pleasant tidings. Is someone around you behaving in a way that's immature, erratic or impulsive? If so, avoid those people, because they're going to bring you down and prevent you from moving forward. Keep them at a distance, or you may find yourself drawn into their negative ways. The Knight of Swords is chivalrous, and his card indicates someone in your life who is loyal, with determination and strong convictions. Is that you, or someone around you? In addition to signifying a person, the Knight of Swords can be a reminder that we need to pay attention to the truth... even when we don't like what we're seeing. In reverse, the Knight warns us that our own enthusiasm can sometimes lead to hurt feelings in others. Is your excitement over something new making your old friends feel like they're left behind? Did you accidentally leave someone out of something because you weren't thinking of their needs, only of your own? If you've done this by mistake, now is the time to recognize it and make amends for your slip-ups. The Queen of Swords, like other court cards, may represent a person or a concept, depending on the situation. In many readings, the Queen signifies a woman who is stubborn but a bit aloof, looked up to and respected but not always approachable. Sometimes, it's not a specific woman, but the idea that perhaps you're shutting people out, presenting the image that you think too highly of yourself. Others may like you, but they can find you intimidating simply because of your attitude. Learn to be more open. It will get you much farther than being reserved. When she appears in reverse, the Queen indicates someone who is judgmental and narrow minded. This is someone who refuses to listen to new ideas–not because she (or he) is opposed to them, but because of their own inflexibility. This is a person who sticks to tradition for tradition's sake, and it can make her (or him) very resistant to change. The King of Swords can indicate a man in a position of authority, although it is not always a male; many strong and empowered women can be represented by the King of Swords. This card also symbolizes truth, fairness and honor. In some traditions, the King of Swords references a person who carries a position of power–military personnel or law enforcement, for instance. How does this apply to you and your current situation? Much like his counterpart, the Queen of Swords, the King of Swords in reverse can be narrow minded and rigid. He's so inflexible that it's very difficult to communicate to him about any ideas that are not his own. He can sometimes come across as harsh or judgmental just because of his own inability to be tolerant of new ideas, people, or concepts. What Do the Cup Cards Mean in Tarot? What Are the Meanings of the Swords in Tarot?